The shortage of arable land and water and rising food demand needs in the United Arab Emirates (U.A.E.) are satisfied by imports from different parts of the world, which accounted for 80% of the total food supply in U.A.E. Red meat being auspicious meal to Muslims community, it has huge demand for its consumption specifically during festive. The U.A.E. in addition to domestic consumption, it is among world’s top tourism countries, attracting over 10 million tourists per year, who are also raising the demand of red meat from hotel industry. Major imports of red meat are from Australia, Brazil, U.S.A., and India. Around USD 300 million imports were from Australia in 2017, which was hiked by on the back of bans being imposed on red meat importation from Brazil and U.S.A. Sheep meat is preferred over the other types of meat among the population of the U.A.E., which accounted for 68.2% of the total red meat consumption. Goldstein Research analyst forecast that the U.A.E red meat market size is set to grow at a CAGR of 6.3% over the forecast period. Total U.A.E. meat consumption in 2017 was 419,000 MT, which declined since 2016 on account of limited of red meat firstly, after imposition of ban on imports from Brazil who were accounted accused for irregularities in quality check of red meat, and lastly the lengthy re-accreditation process to be followed by Halal-certifiers, to continue their supply of halal products to U.A.E. The growth in red meat consumption, stringent check on imported red meat, production and import of live animals for their auspicious occasion i.e., Eid al Adha feast, rise in the U.A.E. tourism industry and government support are some of the major factors that may induce the growth of U.A.E red meat market. 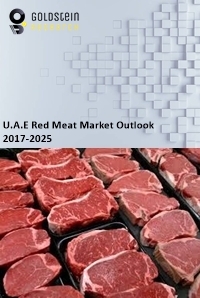 The report covers the present ground scenario and the future growth prospects of the red meat market for 2017-2025 along with the U.A.E sales and U.A.E revenue of the red meat. We calculated the market size and revenue share on the basis of revenue generated from major players across the globe. We have forecast the market on the basis of red meat manufacturers, red meat import and export data, and production and import of live animals. On the basis of meat type, lamb accounted for highest market share of 53.4% in 2017. Lamb is largely consumed by the people on every occasion, as it is considered auspicious meal and it also preferred by the tourists. Shelf stable meat is growing at a rate of 5.2% for its larger preference by the consumers over the frozen and chilled food. Vacuum packed red meat accepted by the U.A.E. has increased the shelf life by 25% and thus increased the profits. Red meat market outlook 2017-2025, has been prepared based on an in-depth market analysis from industry experts. The report covers the competitive landscape and current position of major players in the red meat market. The report also includes porter’s five force model, SWOT analysis, company profiling, business strategies of market players and their business models. U.A.E red meat market report also recognizes value chain analysis to understand the cost differentiation to provide competitive advantage to the existing and new entry players. Online distribution channel for red meat is trending in the country. Consumers had the habit of purchasing fresh meat from butchers, but a shift in purchasing habits and relying of online distributors has influenced the growth of U.A.E red meat market. Government support for increasing the production and imports of red meat and to keep quality check is one of the major driving factors growing the U.A.E red meat market. Government had imposed ban on beef imports from Brazil and U.S.A. over the quality concerns that were lifted after modified regulations on importing beef meat. Government has offered subsidy support, duty-free imports of raw supplies and interest free loans to suppliers and distributors. People of the U.A.E. are highly conscious over the freshness and purity of red meat. Government has strict check over the quality and phytosanitary norms. Supply of rotten or salmonella-tainted meats can severely impact the red meat demand. There is always a risk of disease spreading among the cattle and contaminating their meat and fulfillment of government regulations are being the major challenges for the suppliers of red meat. U.A.E has a combination of factors influencing the red meat industry. Healthy economic growth, increasing tourism, growing hospitality sector, growing no. of hotels and restaurants has led to influx of foreign currency, which assumes rise in normal trade and consumption pattern of the country and experiencing reversal of declining red meat market in 2018. Moreover, U.A.E. will host World Expo in 2020, requiring more infrastructure development with huge investments. This will be requiring large imports across various sectors, including food and agriculture related products. Thus, backed by these factors, U.A.E. red meat market is expected to expand in near future. What is the revenue of red meat market in 2016-17 and what would be the expected demand over the forecasted period?